Cell phone pocket on the shoulder strap (the biggest phone size fit iphone 8 plus, quickly get cards and cash), redesigned side pocket with adjustable be used as water bottle holder ( the biggest bottle diameter is 4" ), wearing this sling backpack is super comfortable, no worry to feel hot with the breathable back design. Made of a lightweight, STURDY MATERIAL. Room for camera, tablet or a small laptop computer (up to 12"). One shoulder backpack gives you the option to change which shoulder. whatever you want to rest it on by clipping to the right or left bottom loop. 2. Please do not iron it. 3. Please don't wash with bleach. We assure 30 days money back or replacement if you are not 100% satisfied with our bag, and 12 months free warranty. ♦Versatile & compact sling bag - perfect as city daypack and for traveling. ♦Size : 11 * 6 * 17 Inch (L*W*H), featuring a spacious main pocket. Room for camera, iPad or a laptop computer up to 12". ♦Multi-purpose : One shoulder backpack gives you the option to change which shoulder. whatever you want to rest it on by clipping to the right or left bottom loop. 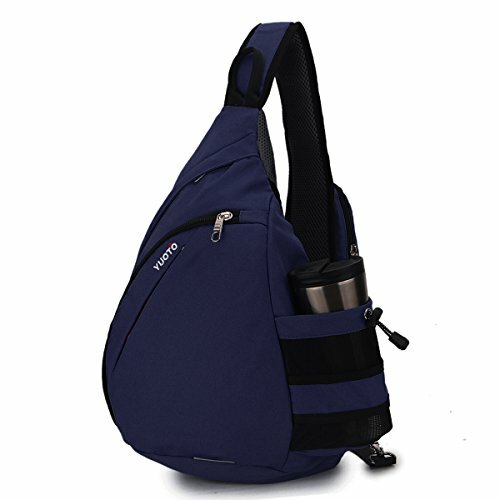 ♦Design : Cell phone pocket on the shoulder strap (the biggest phone size fit iphone 8 plus, quickly get cards and cash), redesigned side pocket with adjustable be used as water bottle holder ( the biggest bottle diameter is 4" ), wearing this sling backpack is super comfortable, no worry to feel hot with the breathable back design. ♦Stands Tough Against Wear & Tear: water-resistant polyester canvas with top-quality zippers and durable strap clip，Widen the breathable mesh back padding. If you have any questions about this product by YUOTO, contact us by completing and submitting the form below. If you are looking for a specif part number, please include it with your message.